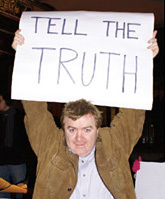 Phelim McAleer, Director's Statement on www.mineyourownbusiness.org, July 2006. I remember a time, not so long ago, when the man with the sandwich board warning the world that the end is nigh was a comic figure. He appeared in cartoons and comedy sketch shows as the clownish, nerdish figure that others made jokes about. But remove the glasses and the grubby raincoat from the man with the sandwich board and replace it with an ethnic shirt, maybe a pair of sandals and write on the sandwich board that we are all going to be damned because the oil will run out. Or maybe the message is that we are all going to be doomed because we have cut down the forests or because of global warming and suddenly we take the man with the sandwich board very seriously indeed. Hundreds of years after we have become rich and comfortable by removing our forests and exploiting our natural resources such as coal, oil, and gold we are now going to the poorest countries on the planet to prevent them from doing what we did and having what we have. We want them to stay as 'traditional peasants' forgetting all the while that the poor people desperately want progress and desperately want to enjoy the good, healthy and long life we in the west take for granted. "Mine Your Own Business" will make a lot of comfortable western people very uncomfortable indeed. It will show them the consequences of their blind faith in our new religion-the religion of environmentalism.